I know Friday the 13th Part VIII: Jason Takes Manhattan wasn't the first entry in the series that I saw (I had seen 4-6, and I THINK Part 2 before), but it may be the one I have seen the most number of times. It was one of only two Fridays I had on tape as a kid, and the other was Final Chapter which I was too scared to watch alone, reducing my exposure until I grew a pair. But Manhattan I could handle - as I mentioned before, it made me more afraid of New York than Jason, as I was too young to understand that it was Vancouver (and also a goofy script). But it was just that: a tape - I have never gotten a chance to see it PROPERLY* on the big screen, so I'm happy to announce that it's the next HMAD screening at the New Beverly! And it's the 25th anniversary to boot! 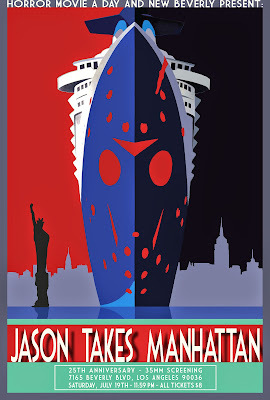 We did New Blood last year for its own 25th birthday, and it was one of the more successful HMAD shows, so I vowed to do Manhattan - a film I like a lot more than New Blood - in 2014. Sure, it's no one's favorite entry, but I think it's better than it's given credit for, as so many people fixate on the "He's only in New York for 5 minutes!" (the timing varies depending on the complainer - the actual time is around 25 minutes) without bothering to acknowledge that he was on a giant cruise ship for the first hour! The whole appeal of putting Jason in a metropolitan city was that it was something different for him - I'm not sure why people seem to forget that a ship was a new environment as well. This gave him many new implements to use (sauna rock! guitar! antenna! ), a wealth of victims (Jason gets one of his highest on-screen kills counts in this one - and his 2nd biggest overall after Jason X, since a ship full of anonymous students is sunk), and a welcome change of scenery - this is one of the very few entries in the series that can be identified instantly even by a casual fan. It also marked some major milestones for the series. Most importantly, it was the first time an actor returned to play Jason - Kane Hodder was brought back, presumably because the producers realized he was the only good thing about New Blood ("in 20 years people will still defend this rubbish mainly because he looks so great!" is what they probably said), and even though this movie was not very successful he still got asked back for the next two installments. The series may never die, but I doubt we will ever again have an actor play Jason across four movies, so Kane will forever be the most prolific Jason. It was also the last entry to be called "Friday the 13th" until the remake, as the next few entries would be "Jason ____". Likewise, it was the last film for the original Paramount era of the franchise - after the film's less than desirable box office take, they opted to let New Line take over for the next 20 years or so (Paramount recently got the series back in exchange for giving Warner Bros a piece of Chris Nolan's Interstellar). If not for studios being willing to trade their properties around, this could have been the last we ever saw of the hockey masked psychopath. But the series has endured, which is why these screenings tend to be pretty crowded - series that are long dead don't quite have the same pull as one that's still going, as old school fans who want to relive their opening night memories are joined by newcomers who were far too young (possibly not even born) when the film was released. As of now we have no definitive special guests (but 3 maybes! ), but Q&A or not it's gonna be a fun time. The New Beverly is located at 7165 Beverly Blvd in Los Angeles, 90036 (2 blocks west of La Brea). Street parking is easy to find - Formosa is your best bet, usually (just watch the signs on the other side streets as some of them are permit only). Tickets are 8 bucks cash or card at the door, or online at BrownPaperTickets. I'll have some DVDs to hand out for dumb trivia questions, and usually there's a guy dressed as Jason in the crowd so have your cameras ready! The fun begins at 11:59 pm on Saturday, July 19th - if there's a Q&A it will as always be BEFORE the movie, so get there on time! And dig the poster by Jacopo Tenani! He's been doing these for a couple of years now but I dare say this is my favorite one that he's done. Some folks have even asked about getting a print copy - if you're interested let me know! With enough demand maybe we can have some printed up for sale. Feel free to post the image on your own site if you want to help pimp the show, but PLEASE credit Jacopo if you do! *The Cinefamily showed it a couple years ago, but the crowd was typically awful and yelling at the screen the whole time, so I spent half the time rolling my eyes, looking back to tell someone to shut up, or exchanging sighs with my friend. So it doesn't count. graffiti all over it-not a usual occurrence here. It was kinda cool thinking Jason was lurking here-coulda used him here in 2011. Watch for the studio sprinkler above Hodder when he looks down at the escapees to the life boat - it spins and totally steals the scene. And no way is 8 better than 7. I understand why it didn't happen then, but I do wish this could have been last month. Not only could it have been on Friday the 13th, but on Jason's birthday itself! I actually do enjoy this one (but I pretty much enjoy all of the films).